KP’s herbal products have passed through the TCM industry’s most rigorous testing standards and inspection processes. Our herbs pass tests for the full range of today’s contaminants. Tests include analysis for heavy metals, dangerous pesticides, sulphur dioxide, aflatoxins and aristolochic acid. 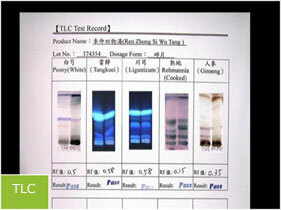 These tests are integrated into our manufacturing process for quality control Traditional Chinese Medicine. A Certificate of Analysis (COA) is produced with each batch of herbs. The COA documents the excellent quality of our herbal extracts. Only batches that fulfill the KP ‘Golden Standard’ are packaged and distributed. The Golden Standard is a collection of the strictest criteria of the safety standards from the U.S., Singapore, the E.U. and Japan. The high standard ensures KP’s herbal products may be consumed safely across the world, making them truly world-class. Standard tests concerning solubility, stability etc. TLC (Thin Layer Chromatography) to (re)confirm identity. Thin Layer Chromatography is a process by which the unique ‘footprint’ of each herb is created. The foot print is then compared to a known standard to insure both the accuracy and the consistency of each final product. High Performance Liquid Chromatography is used to identify the chemical components of each herb and formula. Final products are analysed to ensure consistent levels of identified active ingredients through the reference substance. 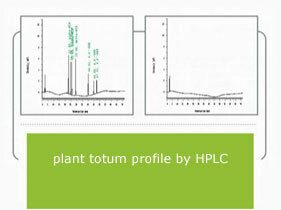 HPLC (High Performance Liquid Chromatography) to determine and/or quantify relevant markers. Standard test and microbiological assays to screen for Salmonella, E coli bacteria + total bacteria count. Heavy metals refer to metallic chemical elements that have a high density and are highly toxic. KP takes precautions to audit its suppliers’ products to ward against heavy metals. Once herbs reach KP, they are analyzed as raw herbs and again post-processing in the form of granules. KP uses inductively coupled plasma mass spectrometry (ICP-MS) to detect for the five heavy metals that pose the most serious risk toward human health: lead, copper, cadmium, arsenic and mercury. Lead contains toxins destructive to the nerve system. It can also cause brain and blood disorders. Copper is essential to human health in small quantities. However, when present in high concentrations, copper in the body can lead to nausea, vomiting, stomach cramps, diarrhea, epilepsy and even death. Cadmium has a very long half-life (over thirty years) and accumulates within bodily organs over time. It has no known effective treatment to expel it from a person’s system, making prevention absolutely critical. Ingesting it can cause vomiting, diarrhea, abdominal cramps, pain and shock. Arsenic (III) combines with other elements to form inorganic arsenic compounds. These compounds are known to be human carcinogens. Exposure to arsenic also damages skin tissue, causing skin lesions and damaging the mucous membrane and endothelium. Mercury exposure can result in permanent nervous system, brain damage and kidney damage. Fetuses exposed to mercury may manifest problems as children. KP analyzes for heavy metal content in herbs with ICP, a technique much more accurate than those specified in the Chinese Pharmacopeia. KP upholds standards for heavy metals under which KP employees would proudly consume. KP never departs from its strict standards for safety and is always strengthening its standards in favor of safety. Chemical pesticides are generally classified into organochlorine, organophosphate, carbamate and pyrethin. Of these, organochlorine pesticides have the longest history of use, are most potent in effectiveness and are also the most harmful to human health. Although many organochlorine pesticides are already forbidden by law, their persistent nature resists being broken down and can remain in the environment long after use. KP takes a comprehensive approach to testing for pesticides. KP’s labs test not just for the chemical compounds in the pesticide itself, but also test for the byproduct chemical compounds. Pesticide analysis must anticipate all potentially harmful chemical changes produced in the plant to be truly effective. The techniques generally employed to detect for pesticide residuals are thin-layer chromatography (TLC) or gas chromatography. TLC is used in most general cases because it is simple and easy to execute. Yet KP insists on using gas chromatography because of its high sensitivity, precision and more reliable results. Chinese herbs derive from natural plants. Like any plant material, herbs are vulnerable to mould and insect infestation, especially when stored in poor conditions. Mould or infestation can ruin a crop and mean a financial loss for a farmer of herbs. To counteract mould and infestation, many Chinese-mainland farmers fumigate their herbs with sulphur-based vapors. The resulting sulphur dioxide wipes out existing pathogens, bacteria and halts decay from insects and herbs, acting as a chemical preservative. The gas is able to reach even unexposed spaces. The application of sulphur dioxide, however, alters the very nature of the herbs. Sulphur dioxide bleaches the herbs Dioscorea (shan yao), Pueraria Root (ge gen) and dried ginger (gan jiang). KP opposes the use of sulphur dioxide in herbs because of the serious effects on the nature of Chinese herbs. Sulphur dioxide causes high sugar-content herbs, such as Cibotium (gou ji), becomes noticeably more acidic. Sulphur dioxide oxidizes herbs with fatty oils, such as Persica (tao ren), and gives them a pungent oily odor. Sulphur dioxide fumigation also damages the fundamental qualities of fragile herbs such as Chrysanthemum (ju hua). Sulphur dioxide fumigation also produces some inorganic sulphites as a byproduct. For certain individuals, sulphites can cause adverse reactions and harmful side effects such as diarrhea, allergic reactions and asthma. KP takes actions to prevent sulphur fumigation from being applied to its raw herbs. KP’s quality control teams analyze herbs for sulphur dioxide. KP employs the following methods aerated-oxidization, iodine titration, atomic absorption spectroscopy and direct color comparison. KP uses the Rankine method for sulphur dioxide residue analysis. In this method, the herbal sample is reacted with acid and then distilled. The sulphur dioxide is absorbed into the oxidized H202. The resultant sulphuric base is titrated with standard base. The resulting colors determine its sulphur content: olive green indicates no oxidized sulphur residue while a purplish-red color indicates a presence of oxidized sulphuric acid. KP’s labs obtain chemical markers to distinguish the authentic herbs from common substitutes. All of KP’s herbs are produced without aristolochic acid according to traditional Chinese preparations. The aristolochiaceae plant family is dispersed across tropical areas. The world contains about 200 subspecies in the family. A few species are commonly used Chinese herbs such as guang fang ji (aristolohchia fangchi), aristolochia mansuriensis, Aristolochia contorta bunge or the ripened plant Aristolochia debilis sieboldet zuccarini. Reports indicate that aristolochic acid is a carcinogen. Aristolochic acid is believed to be the primary cause of Belgian Chinese herbs Nephropathy (CHN), as well as incidents of acute fibrosis in the kidney area and urinary tract cancer. It may also possess oncogenic properties. In light of these alarming reports, aristolochic acid is considered a dangerous and toxic substance. Since 1992, KP has put extra effort into promoting awareness towards the serious dangers of mistaken identification of herbs and the inauthentic herbal products on the market. KP has found more than 20 misidentified herbs on the market in the last decade. As a company that values safety, KP’s quality control teams take authentication and screening for aristolochic acid very seriously. Aspergillus flavus is a fungus that occurs in pesticides, soil, corn, peanuts, hay and animal organs. Aspergillus flavus has also been found in Chinese herbs such as corydalis (yan hu suo), cyperus (xiang fu) and jujube (da zao). It thrives especially in warm temperatures of 77-86°F, a relative humidity above 75% and a pH level above 5.6. The fungus can actually grow in temperatures as low as 54° but will not be toxic. Strains of the fungi Aspergillus flavus and Aspergillus parasiticus produce aflatoxins. Researchers have determined that four kinds of aflatoxins are highly toxic and possibly carcinogenic; they have been classified into categories B1, B2, G1 and G2. To identify the type of aflatoxin, the sample is dissolved in chloroform. If the substance then exhibits a blue color when exposed under UV light, then it is either B1 or B2. If it exhibits a yellow-green color, then it is the G1 or G2 type. Another mycotoxin, ochratoxin A, flourishes in temperatures around 77°F and a humidity level of 18.5%. Ochratoxin A has been detected in soil, milk, rice, grain, flour, yellow beans, peanuts, corn, coffee, grains, vegetables, herbs and animal feed. Ochratoxins thrive in inferior Chinese herbs stored in poor conditions. KP analyzes the herbs’ raw materials for the volume of Ochratoxin A, to keep herbs from metabolizing ochratoxins and to guarantee the herbs’ safety. KP enforces strict international regulation standards. Aflatoxin and mycotoxin testing is performed on all herbs at risk of contamination. KP’s values high-quality premium herbs and herbs that contain unacceptable aflatoxin and ochratoxin levels are discarded These strict standards keep herbs safe and efficacious for consumers.